WASHINGTON — After President George W. Bush twice carried the New Hampshire county that includes vote-rich Manchester and Nashua,President Obama turned the tables and won it in both his elections by similar margins. Mr. Bush handily captured the Ohio county that includes Cincinnati and its mostly white suburbs in 2004, while Mr. Obama won there running away in 2012. Colorado and Virginia went for Mr. Bush, then flipped to Mr. Obama. Now that Mr. Obama has endorsed Hillary Clinton, her advisers are eager to use his political touch in those and other battleground states and extend the Democratic streak there this fall. They see Mr. Obama as a one-of-a-kind resource — a popular sitting president — in the looming campaign to defeat Donald J. Trump. Political strategists at the White House and in Mrs. Clinton’s campaign are just beginning to hammer out a specific stump-speech schedule for the president after his endorsement on Thursday of his former secretary of state. Mr. Obama and Mrs. Clinton will appear together on Wednesday for the first time since she secured the Democratic nomination, and they have chosen Green Bay, Wis., another city where Mr. Obama lifted Democratic fortunes. But that is likely to be one of the few times they appear together. Instead, Mr. Obama will be on his own, cutting a path across white suburbs in the Midwest and Rust Belt and spending time in African-American communities in Mid-Atlantic States like North Carolina and Virginia. The president will reach out to independents and others in New Hampshire and Iowa, and rally young people, Hispanics and Asian-Americans in competitive states like Colorado, Florida and Nevada. Mrs. Clinton’s advisers, citing Mr. Obama’s solid approval ratings and popularity with Democrats and some independents, said they thought he would be a net asset in Colorado, Florida, Michigan, Ohio and other battleground states that he carried in 2008 and 2012 and where he is arguably more popular now. All those states are critical to Mrs. Clinton’s electoral strategy. “There is not a battleground state on the map where President Obama is not an asset,” said Brian Fallon, a spokesman for the Clinton campaign. Mr. Obama’s advocacy for free-trade agreements and his administration’s rules allowing hydraulic fracturing, or fracking, are unpopular with liberals, among others. And it is unclear how effective the president can be in transferring his popularity to Mrs. Clinton. During the midterm elections of 2010 and 2014, Mr. Obama campaigned on behalf of Democratic lawmakers but his party was routed by Republicans both times. Still, Clinton advisers said he would be a powerful voice attacking Mr. Trump’s fitness and temperament for the presidency and championing Mrs. Clinton’s determination to build on his record of economic growth, expansion of health care and civil rights progress. He also can testify to her character, portraying her as putting patriotic duty ahead of their personal rivalry when she accepted his offer to be secretary of state in 2008 after their bruising primary battle. 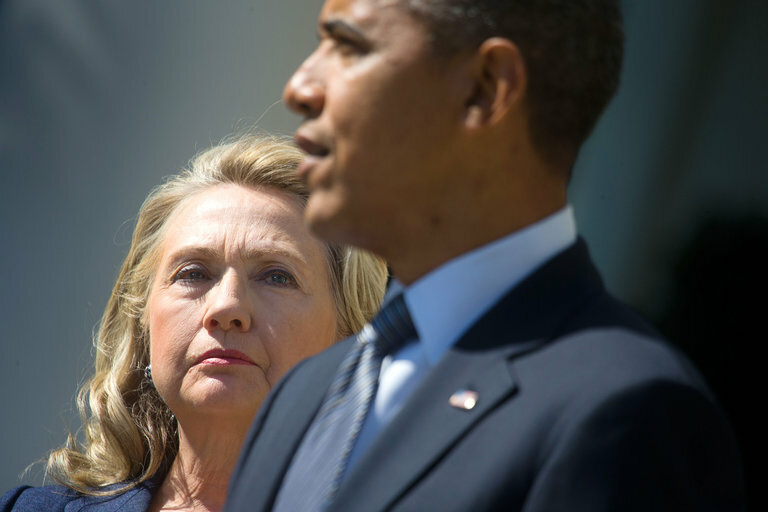 In doing so, Mr. Obama may be able to help Mrs. Clinton dent her high unfavorable ratings and persuade some voters to put aside their doubts about her honesty and trustworthiness — weaknesses that regularly show up in polls. 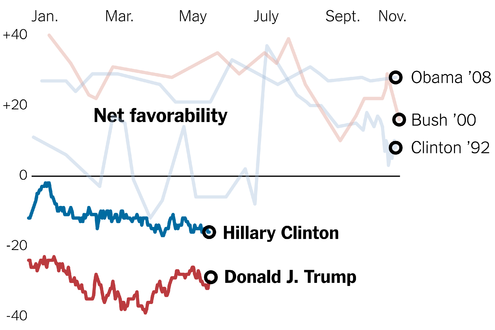 Hillary Clinton and Donald J. Trump head into the presidential race with the worst favorable ratings of any presumed nominee in decades. Mrs. Clinton’s advisers said they were not sure yet how often she and Mr. Obama would campaign together, but said they were eager to deploy him. Mr. Obama is bound to campaign mostly in Democratic strongholds this fall to help energize voters and ensure strong turnout, but the advisers emphasized that they did not feel boxed in about where they could send him. As one adviser put it, Mr. Obama was broadly popular enough that he could campaign in vote-rich Cleveland without the Clinton campaign worrying too much that voters in Parma, a suburb, would be turned off by regional news coverage of him. During the initial weeks of the general election campaign, Mr. Obama is likely to focus on suburban communities in Wisconsin, Minnesota and Pennsylvania where the strategists believe that the president will be well received, especially among voters who are not strongly aligned with a party, or who may be turned off by Mr. Trump’s more bellicose rhetoric. Some Democratic officials also think Mr. Obama can help Mrs. Clinton by directly appealing to supporters of Senator Bernie Sanders in states like Wisconsin that he carried this spring. While Mr. Obama and Mrs. Clinton share some policy goals and positions that are not liberal enough to satisfy some Sanders supporters, Mr. Obama still enjoys a measure of good will with many of them as a two-term president. Still, some Sanders supporters said they were devoted to their candidate and ambivalent about hearing Mr. Obama extol Mrs. Clinton. “I certainly am proud of the things that President Obama has done, and admire him, but we also need some time to grieve the end of the nomination race,” said Pat Cotham, a Democratic superdelegate who recently endorsed Mr. Sanders, and a county official in Charlotte, N.C. — another area the Clinton campaign would like to dispatch the president. Mr. Obama won North Carolina in 2008, but lost there in 2012. Clinton advisers think he could help Mrs. Clinton put it back in the Democratic column. Mrs. Clinton’s Democratic allies also hope that Mr. Obama’s efforts on her behalf will impress suburban women, providing her with an effective, levelheaded counter to the appeal that Mr. Trump demonstrated among white, blue-collar men during the Republican primaries. An analysis of voting patterns by The Upshot shows that Mr. Obama did even better in 2012 than previously thought in the mostly white counties around Cincinnati. In Butler, Warren and Clermont Counties, the analysis showed, Mr. Obama improved upon the performance of John Kerry, the 2004 Democratic presidential candidate. The focus on independents and suburban women, and the message from the president on behalf of Mrs. Clinton, are likely to shift as Election Day draws closer. In October, Mr. Obama could be expected to fly Air Force Oneinto places where he can energize turnout among core Democratic supporters. Aides said the president’s October calendar has been largely cleared of other activities, leaving him time to campaign wherever Mrs. Clinton needs him. Mrs. Clinton’s strategists said they were likely to send the president to the Orlando area in Florida; Montgomery County, Pa., north of Philadelphia; Denver; and Charlotte. Mr. Obama has proved particularly good at winning support from black voters. In 2004, 13.2 million African-Americans voted in the presidential campaign; in 2012, more than 17.6 million did. And Mr. Obama raised the proportion of black votes who supported him, something that Mrs. Clinton’s campaign hopes he can also do for her. In 2004, Mr. Kerry got 86 percent of the black vote; in 2012, Mr. Obama got 96 percent.